El Paso – I had to chuckle as I read the first line of a front-page story in the El Paso Times, which I had picked up in the airport on my way home from a conference: "The average Border Patrol agent in El Paso apprehended 4.2 undocumented immigrants [sic] in 2013, according to a presentation made to lawmakers last week by two experts who study the border." Over the weekend I had the opportunity to study this part of the border up close: the activities of the drug cartels, smugglers, and gangs who routinely violate it; and the impact our government's failure to secure the border has on the lives of Americans living in the border region east of El Paso, who ruefully refer to their community as "Almost America", an exposed part of the United States that serves as a doormat for illegal border crossers. It is not hard to see why apprehensions are so low in the El Paso sector. Years ago the construction of a border fence within the city took care of the problem in the heavily populated areas of the sector. Border Patrol spokesman Joe Romero was quoted in the article explaining the low numbers, saying their strategy was to deter illegal crossers and "prompt" them to return to Mexico before they are apprehended (no apprehensions, no border problem!). But in Hudspeth County, which lies just east of El Paso County, there is little fencing and little patrolling by the Border Patrol. According to Hudspeth County's Chief Deputy Sheriff Robert Wilson, anyone can cross the border illegally here, anytime, day or night, whenever they want to, for any purpose – and they do, every day and every night, whether to deliver loads of smuggled illegal aliens and drugs or to deliver groceries to relatives on the other side. Hudspeth County, with a total area of 5,500 square miles (the size of Connecticut), has 98 miles of the border within its limits and less than three miles of fencing. The fencing, constructed of 15-foot-high four-inch square iron poles, looks very formidable where it is – until it ends abruptly. In the area where the fence ends, the Rio Grande is no more than a small stream that anyone could wade or jump across – when it has any water flowing in it at all; most of the time it is dry. We were told that there are 800 Border Patrol agents assigned to cover the county. However, according to our guides (a resident and several sheriff's deputies), under orders from headquarters in Washington, DC, these agents are not permitted to patrol the area between Interstate Highway 10 and the border. The agents reportedly are restricted to working the vehicle checkpoints on I-10, and only move into the expanse between the Rio Grande River and the highway to respond to an alert from a resident of one of the pecan, cotton, or livestock ranches that abut the river, or perhaps from a sensor tripped by illicit movement. We were told that about 10 such alerts occur every couple of days in this area alone. The problem with this approach, according to our guides, is that Border Patrol agents cannot possibly respond in time to apprehend illegal crossers. The smugglers leave cars parked in the area for crossers to hop into, and they can reach either the interstate or a smaller state highway in just a minute or two. These highways are plainly visible from the border embankment. Perhaps the Border Patrol uses remote surveillance and then tries to interdict the illegal crossers as they travel along the highway. But if that were the case, and people and drugs are crossing as frequently as the sheriff's office asserts, then the Border Patrol's apprehension numbers should be much higher than 4.2 per agent per year. It is more plausible that they are missing a lot more crossers and contraband than they are catching, and don't have a clue about what they're missing. We avoided the checkpoint by taking a smaller highway around it, right into the county seat of Sierra Blanca, a town of about 800 people. Three small Mexican towns lie across the river. In 2010, the Sinaloa drug cartel, which controls this area, came to one of the towns, , El Porvenir ("The Future"), and hung up banners informing the 3,000 residents that they had 72 hours to leave their homes or be burned out. On the designated night, Americans watching from across the river counted 36 homes on fire, as well as the church and businesses. Some of the families applied for political asylum in the United States and others settled illegally. There are now 300 residents of El Porvenir, including some cartel members, and the former homes along the river are now stash houses and staging areas for the thriving and well-orchestrated smuggling operations. The specific section of the border zone we toured is used more for drug smuggling than human smuggling. The cartel has organized its plazas, or territory, to keep the drug smuggling away from the human smuggling because it believes that the human smuggling, while lucrative, could potentially attract too much attention from authorities. This area has been the scene of numerous incursions by the Mexican military, which sometimes provides security for incoming loads of dope. In one well-publicized incident in 2006, sheriff's deputies filmed their vehicles, which had been stolen in El Paso, after they became stuck in the Rio Grande. The vehicles were torched that night and within three days the thugs involved were executed by the cartel because they had been photographed. Nowadays the cartels use ultralight aircraft to ferry across loads, which are then picked up by workers on the U.S. side and sent on their way. The constant illegal border traffic is the chief public safety issue in the tiny rural communities of Hudspeth County. Every year the department seizes hundreds of thousands of pounds of narcotics, which they estimate to be only a small fraction of what passes through undetected. The cartel has succeeded in attracting local teenagers to its employ, often as lookouts for law enforcement activity. Sheriff Arvin West has 17 deputies to cover the entire county. Five are assigned to the border area near each town, which means only one deputy is on duty in a town at any given time. In addition to the official port of entry in Fort Hancock, there are two footbridges across the Rio Grande that serve as an entry points. They are unmonitored, even electronically. Under the terms of a long-standing treaty with Mexico, they cannot be removed. Clearly Hudspeth County is not experiencing the same volume of illegal crossing as is taking place in many other border zones, like the Rio Grande Valley or the Tucson sector of Arizona. But one can't help but worry about who might take advantage of this unguarded place. According to Chief Deputy Wilson, at one point there were "droves of Middle Easterners" crossing illegally, until the cartel had that particular smuggler killed, perhaps concerned that this would draw too much attention from the feds, or perhaps because he missed a payment. 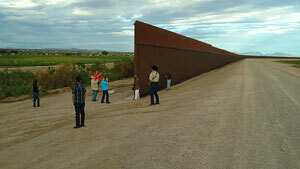 The unsecured border is not only dangerous for Hudspeth County residents, it can be costly, too. The county is frequently obliged to search for and rescue people who become lost or are abandoned by the smugglers in the harsh terrain, which includes the Eagle Mountain Range. This occurs 50-100 times a month. In one such operation, eight different agencies, including the sheriff, ICE, and the Texas Rangers searched for two months for a man whose partially decomposed body was found in a canyon after his smuggler, who was in jail in New Mexico, led officers to the spot. That single operation cost taxpayers $37,158 for personnel, overtime, aircraft, fuel, and mortuary expenses. Of that, $13,213 was county money. This activity must be a significant fiscal burden in a county with a per capita income of $31,000 per year. Or maybe instead of spending state tax dollars to pay for academic studies promoting a more open border on behalf of multi-national corporations, they could send some of that funding over to Hudspeth County to help keep out the Sinaloa cartel and other terrorists.